Disappointed by the lack of media coverage of Haverford campus life, Thy Vo ‘14 teamed up with her fellow students to create The Clerk, the college’s first online newspaper. “We hadn’t had a regular news source at Haverford. I personally was frustrated because I felt there was a lot of important events and student work we should be covering,” said Vo, who is The Clerk’s first editor-in-chief. Launched on April 2nd, The Clerk has already published a variety of news articles detailing a wide range of campus events, from gym renovations to declining acceptance rates. In addition to its news stories, The Clerk features an opinion page of satirical Haverford cartoons and articles challenging the school’s allocation of funds as well as a features section addressing Haverford beer preferences and environmental sustainability projects. Although the paper is not yet being published regularly, its founders hope it will become a weekly email newspaper. “We have a lot of new writers and we need time to develop. We will publish more regularly when we build up staff,” said Vo. 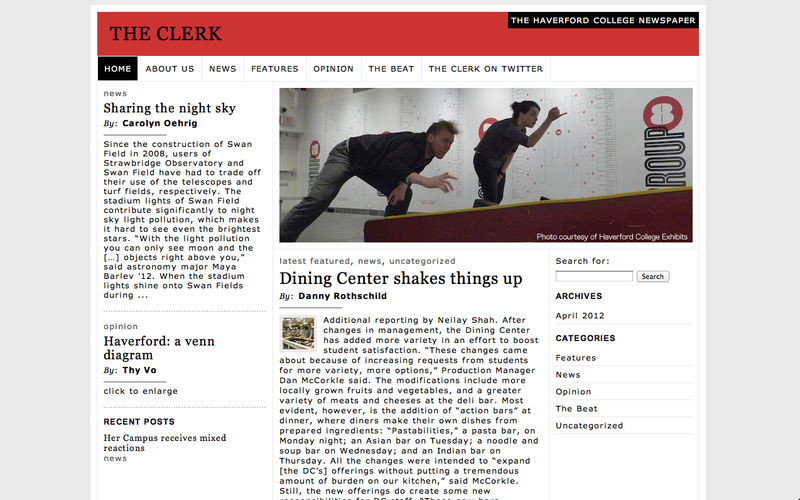 Though The Clerk is still a fledgling publication, the staff is hopeful that the paper can fill a gap in Bi-Co media coverage and offer Haverford students a learning opportunity in professional media. “I think The Clerk will create an environment that fosters journalism,” said reporter and opinions editor Daniel Rothschild ‘15. Reflecting Haverford’s Quaker tradition, the “clerk” refers to the individual at a Quaker meeting who is responsible for acting as a guardian, resolving conflict and ensuring that everyone is heard. True to its name, the paper hopes to stimulate dialogue on Haverford’s campus. “The Clerk should be an open forum for a diverse cross-section of the Haverford community — students, staff, faculty and administration — to interact on critical community concerns,” said reporter Ian Gavigan ’14. The paper aims to be a resource for the community to talk about complex issues such as the school’s endowment, admissions process, and hiring process for administrators. “We want to create a paper that all the stakeholders in our community will be willing to participate in and want to read,” said Vo. According to The Clerk’s staff, the paper has been welcomed throughout the Bi-Co and has received good feedback from Haverford’s students and administration. “I think Haverford has been waiting for something like The Clerk and will continue to support the newspaper as it establishes itself,” said Gavigan. 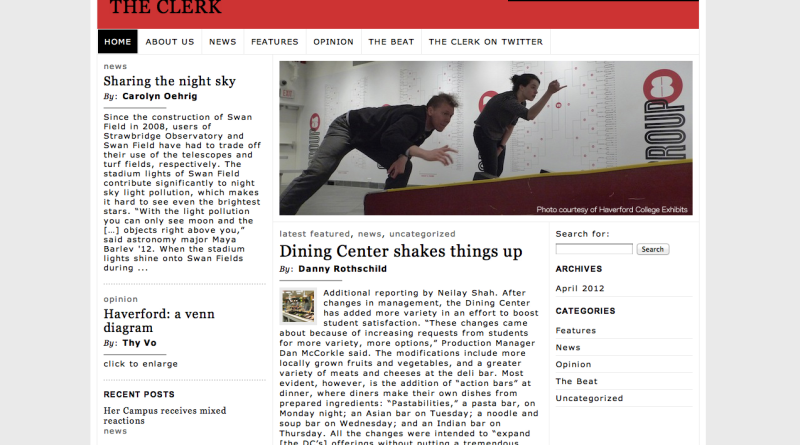 Staff members at The Clerk aim to broaden their coverage and work in multimedia. In doing so, it hopes to be a uniting force in the Haverford community. “Students at Haverford like to be well informed. Hopefully by publishing news regularly people will think more about their community and have greater incentive to interact with students and faculty members outside of their normal social groups,” said Vo.